If you follow the AMA Grand National Series, you know who Brad Baker is – or you haven’t been paying attention. Crowned the 2013 AMA Grand National Combined Champion and GNC Expert Singles titlist, Baker preceded his successful 2013 season with a fifth overall in 2012 and was awarded the Saddlemen Rookie of the Year in 2011. A Washington native, Baker started racing at age five and, as he approaches his 21st birthday, has begun to make his mark on the world stage. Just this month, Baker faced down and beat 2013 MotoGP Champion Marc Marquez at the Super Prestigio dirt track event in Spain. Now, Harley-Davidson has enlisted Baker, Jared Mees and Nichole Mees to show X Games fans how exciting ice racing can be. To promote this effort, we had a short conversation with Baker. Q: How did you first become involved with the Street 750 ice racing exhibition? A: Harley-Davidson is coming out with the new Street 750 this year. It had to be debuted somewhere, and we just couldn’t think of a more original fit than doing it here at the X Games and doing some ice riding. Basically, Harley-Davidson has been a pioneer of ice racing for almost 100 years. So, with me being the factory flat track rider, it was a perfect fit for me to come and show what this motorcycle is capable of. Q: What do you think ice racing brings to the X Games? A: I think it brings speed and excitement and a little bit of something that’s a little more dangerous than some of the other games. Being on a half-mile oval on ice with motorcycles with studded ice tires going over 100 mph – just basically the risk factor and danger of having these sharp studded tires. You don’t want to fall in front of one of these things. It’s very, very close, exciting racing. It’s fast paced. You can have two or three riders side by side and the rest of the pack right behind them with lead changes. It’s a very exciting sport that brings a different type of excitement than some of the other games that are already in the X Games. 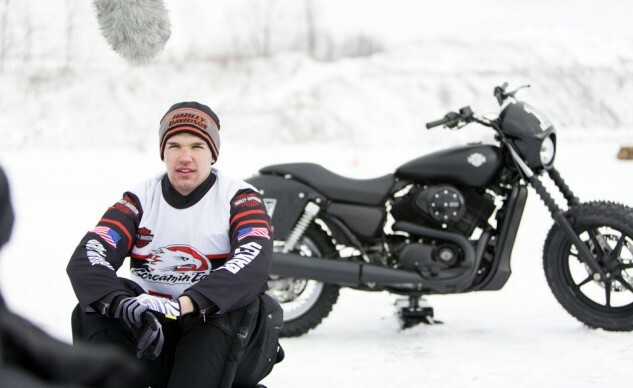 Baker being interviewed for the Street 750 ice racing exhibition short. Q: What do you think makes the Street 750 a good mount for ice racing? A: The Street 750 Harley-Davidson with the new revolutionary, liquid-cooled engine is a great motorcycle, and since it’s a little bit smaller and has a swept back dirt track-type bar plus lower seat and lower center of gravity, you have a really good feel of the motorcycle. It is really nimble and has really good agility and maneuverability. Myself, Jared Mees and Nichole Mees were pretty much the first three riders to ride the motorcycle outside of the factory. It was really cool that it happened to be on ice. It got put to the test, there, and it passed. It’s gonna be even better on the streets. It’s a great video for everybody to watch during the X Games. We’re pretty much leaving it to the fans to see if ice racing will stick. We’d love for all the fans to get involved and go on Twitter and use the hashtag #XGIceRace and state their feeling on whether ice racing should be a medal competition for the X Games in the future. Q: It looks like you didn’t do many mods to the bikes. Is that true? A: Of course, we had to take blinkers, mirrors and horns – stuff like that off that get in the way in competition. We relocated the left foot peg and shifter to get a little more ground clearance. Stiffened up the suspension a little bit and changed the size of the rear rim. So, we went from, basically a 15- to a 16-inch tire. We cut the front fender off so that we could have more clearance for the studs. These bikes perked up and were really fast. All three of us had an exciting time riding them on the ice. Baker and Mees mix it up out on the ice for the X Games exhibition video. Q: Everyone’s been talking about the Super Prestigio event that just happened. How did your involvement in the Super Prestigio get going? A: I’d have to give quite a bit of credit to Mark Gardiner. He’s the one who first informed me about the event and was the first one to get on social media – pretty much calling and asking and poking at the promoters and Marc Marquez. A dirt track race wouldn’t exactly be super if you didn’t have the holder of the “best dirt tracker in the world” title. So, he got it started, and Dennis Noyes got a hold of it. He was involved in promoting the first dirt track race ever in Spain. From there it went to Marc Marquez, and he said, “Heck yeah, get him over here.” RPM Racing, the promoters, were all on it. It just all fell together and turned out to be an amazing race. Q: Did you really think you could pull off that inside pass on Marquez? A: Of course I did. I wouldn’t have tried it – that’s classic dirt track set up, right there. I was giving it about 85-90% of what I’ve got. I wanted to make that race very interesting. You could see that I was pretty much calm and doing my thing, and Marc Marquez was all over the motorcycle and all over the race track, pushing me wide when he’d get up underneath me. Pretty much, I’d had enough. If I was going to go around the outside, he probably would have run me wide again. He heard me coming … if you’re going to mess with the bull, you’re gonna get the horns. You should expect it if you’re going to try to chop the door on me. When it comes to indoor dirt track racing, that sometimes happens. It was unfortunate he had to go down. I think he learned a little bit about how short tracking happens. We both had great respect for each other. We were both good after the race. It turned out to be a great event, and it looks like we might even have another one in 2014 and 2015. Baker and Marquez before the two tangled, sending the MotoGP champ to the dirt. Q: How would you rate the flat track talent in Europe compared to the US? A: I don’t want to rag on those guys, but it’s nowhere close. Marc Marquez, he’s an amazing motorcycle racer – for somebody that is a road racer and rides dirt track to cross-train, he does an amazing job. He was probably the best out of anybody over there that I got to ride with. There were actual dirt trackers from Spain and from Britain, but I’ve had more competition at a local level in Washington than I did there. Dirt track is the oldest two-wheeled sport in America, and it’s the biggest series here in America. It really showed when I went over there. Baker on his way to the 2013 Grand National Championship for Harley-Davidson. Q: Is the opportunity to make a living with flat track on a level playing field with road racing, right now? A: I think flat track has exceeded what road racing’s been for the last two years – with the number of races and appearances on a local level. Especially, the local level for flat track is way over the top of road racing. It’s sad to see road racing going downhill, but flat track racing has definitely superseded it in that area. Q: Since I know that you’re friends with Mark Gardiner, what do you think of his suggestion that the AMA flat track series and road racing series be combined to remake the old-style Grand National Series? A: That would be really interesting. It would be great for the fans. It could definitely be a whole lot of fun, but from a race team/motorcycle manufacturer standpoint, it’s virtually impossible to do today. It would be way too expensive. To make something like that happen is pretty unrealistic. If something like that ever happened, it would probably just be a five-race series: four dirt tracks and one road race. It definitely would be pretty interesting. Q: Do you have any thoughts of road racing in your future? A: No, I’ve got thoughts of ice racing, though. That’s our main focus. 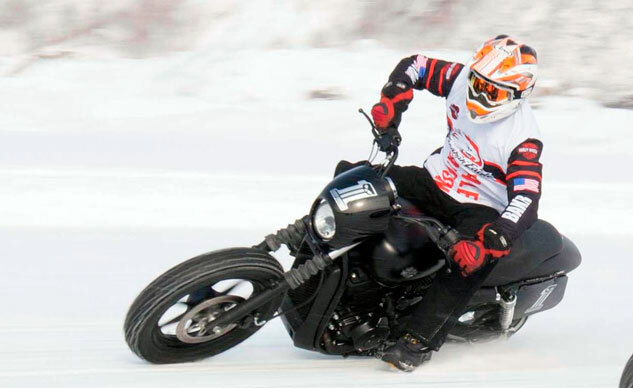 We want to make this ice racing happen for the X Games and do a great debut for the Harley-Davidson Street 750. Our main focus is that hopefully everybody will vote yes for ice racing in the X Games by using our hashtag #XGIceRace to make this deal happen. I think that would be a great deal to spread motorcycle racing, not only just during the summer but also get a lot get a lot going on during the winter, too. Q: Since one of the three people who are doing the exhibition is female, what do you think about the status of women in dirt track in America? A: It’s great. You’ve got Nichole Mees right here with us during the exhibition racing, and she’s here to sign autographs, show the motorcycles, hang out. She’s an amazing racer along with Shayna Texter. She’s on top of her game. I think Shayna Texter is the next one that’s nipping at the heels of Nichole Mees.